This is written incredibly well and the narration is a treat. Are you supposed to laugh out loud at a history book? You will at this one. Are you supposed to stay up late because you can't wait to hear what she's got to say next? You'll do that, too. 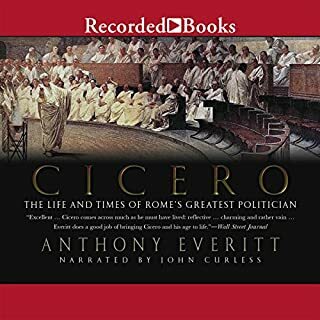 Usually I don't like to listen to history (the narrators tend to put me to sleep) but I am happy to have this in my Audible library. Here's what gives such credibility to the Amelia Peabody historical mysteries set in Egypt. Barbara Mertz and Elizabeth Peters are one and the same. And what credentials she has for giving us this remarkable "popular" history! Mertz is not afraid to use humor in a serious book about the history of Egypt. But, the account is also accurate and full of fascinating information. Who says a scholar can't also be a master of fiction? The narrator adds a lot as well. This is a great listen! 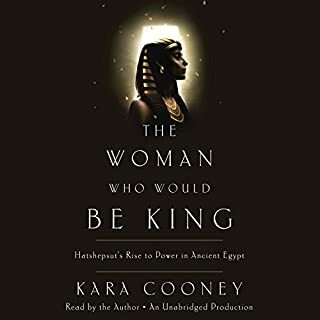 This book is brilliantly written, wonderfully read, and is sprinkled with lots of wry humor -- all of which is especially impressive as it is a rather fact-filled history of Ancient Egypt. The overall effect is something like a Bill Bryson book (say, A Short History of Nearly Everything), only more thorough and academic, and with a much lighter authorial touch. 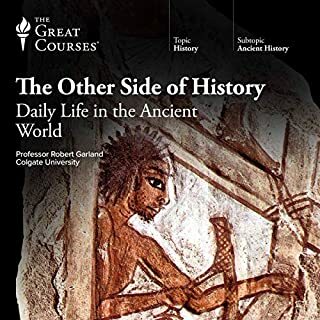 Everything is here: the details of archaeological dating, the characters behind the archaeology, and the progression of the long history of Pharonic Egypt. I am not quite done with the book yet, but already am sad that it will be ending. 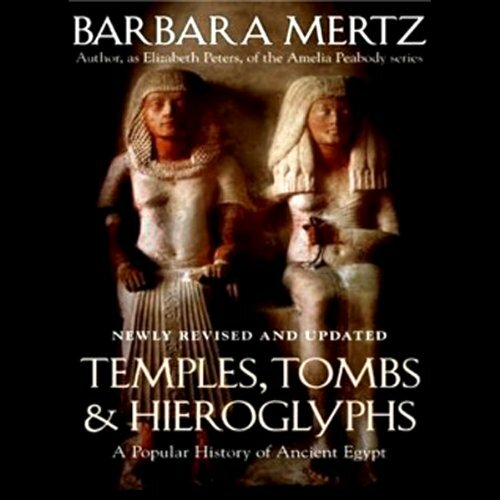 Dr. Barbara Mertz, who wrote the book, received her PhD in Egyptology at the University of Chicago in the 1950s. She wrote this book in the mid-1960s, though it has been updated, apparently, for this audiobook (though I cannot confirm this is the case). From other reviews of the book, I gather that the material in it still reflects current thinking in the field, though some details may have changed. Interestingly, Dr. Mertz is better known for her fiction, she also writes under the names Elizabeth Peters and Barbara Michaels, and she has written many suspense novels as well as the Amelia Peabody, Vicky Bliss, and Jacqueline Kirby series of archeology novels. Her deft touch with words shows in this book, which I highly recommend! 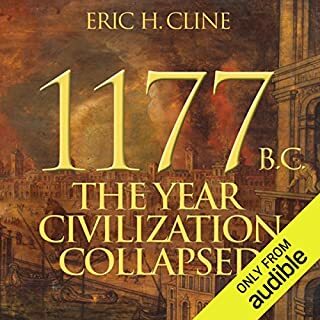 This is the best historical audiobook I've ever listened to, and I've listened to a lot of them. The content is wonderfully accessible and the narrator is a delight. It's like listening to your grandmother tell a great story...if your grandmother had an advanced degree in Egyptology. I love a good book about ancient history. 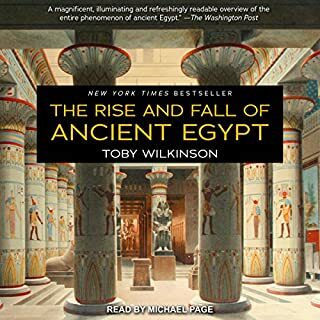 This is an excellent look into Egyptian history written and narrated in a very satisfying way. I totally enjoyed this book and found out more about Egypt than I had known. I thoroughly enjoyed this history of Ancient Egypt by Barbara Mertz. She was able to bring the historical characters and times to life without sacrificing her scholarly ethics - she always carefully explained her own prejudices and opinions to the reader. Her excellence as a writer is undeniable, and one can see why she went on to be such a popular author. And also, her scholarship explains why her popular books were so good. I also found it helpful in reading the book to rent the hard copy from the library and follow along with the maps and plates. For example, where is Abydos and the cataracts of the Nile? 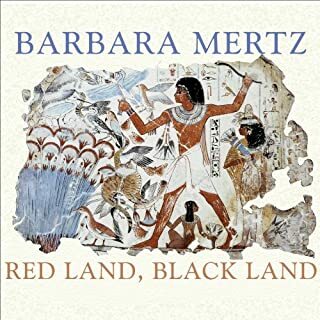 While I was at it, I also rented the book Red Land, Black Land, which was also written by Mertz in the 1960's about all aspects of ancient Egyptian culture. My library just happened to have an original edition of the book. I have actually recommended this book to many people. The book is factual, educational, but never tedious. The author is obviously highly knowledgable on her subject, but knows how to make history come to life, with warmth and an absolutely marvellous dry wit. Having heard Lorna Raver read this book, I cannot imagine anyone else doing it. Her voice is perfect for the author's words, and the expression and animation she brings to her reading elevates this to an art form. If all history was conveyed by the combination of author and reader, we would have an incredibly well educated society. The theoretical tale of Queen Hetepheres and her tomb difficulties was both amusing and wonderful. The tales bought down to us over the centuries of various legendary pharaohs, such as Good King Snefru, have been bought vividly to life. I loved it so much, I sought out Barbara Mertz's other book on Audible : Red Land, Black Land, again read by the marvellous Lorna Raver. It is a viewpoint of the life of ordinary Egyptians in ancient times, and is another vastly informative and entertaining experience. Then I sought out other books read by Lorna Raver, and found to my delight, one of my favourites, Dana Sobel's The Planets, was also an option. It was quickly acquired, and is just as wonderful. This was my second download with Audible. The writing and narration are terrific. I've always appreciated a witty (and dry) turn of phrase. 'Dry', however, is NOT how I'd describe this audio book! It is rich with imagery and information. If you have any interest in ancient Egypt or archaeology, this is a must! Although the subject can be dry, Mertz does a very nice job of injecting humor, folklore, and her own interesting opinions. I'm on my way to Egypt and glad I listened to this first. The narrator is quite good. A fascinating and informing look at one of the greatest empires the world has known. 5000 years of history at your fingertips. Ms. Mertz brings this era to life in her book and Lorna Raver sounds like she authored the book - giving it great credibility and authentic feel! With a factual topic such as Egyptian history, I think it's best to be told the facts and for the reader to then come to their own conclusions as to the why's, who's and when's that historical fact misses out due to a lack of evidence. The author tend to put her own spin on such areas. I don't have an issue with this really, but it is the almost condescending way in which she discards other views from hers, that I have issue with. The facts that are given are in line with well documented works, though the feeling of sanctimoniousness that the author and narrator relay make it hard going for me. Another issue I have is the way the author spend around 10 minutes on the entire late period seems a bit odd and left me with a feeling that she'd run out of patience when writing the book. It is easy to be over critical and I don't wish to be. Overall, the book is informative but runs out of steam at the end and has tried to be too theatrical. I downloaded this audiobook a week before visiting Egypt. It was a great primer for someone with very little knowledge of the country. While I can't stand the American accent of the narrator (or in general for that matter), I liked this audiobook as it is beautifully written.